The Washington Capitals. Fresh off a somewhat lackluster 1-0 win over the Detroit Red Wings on Thursday night, head off for their last visit to Canada for the regular season when they make their only visit to Bell Centre this season on Saturday night to face the Montreal Canadiens. Washington is looking to complete its seven-game schedule of games in Canada on an up-note, facing the Canadiens with a 3-2-1 record in games played in Canadian cities so far this season. On the other side, Montreal might be quietly hoping the clock would tick faster on this season. The Canadiens have lost four in a row (0-4-0) going into Friday night’s game against the Buffalo Sabres and are just 1-7-2 in their last ten contests going into Friday night’s game. It is the worst record in the league since March 3rd, when the Canadiens embarked on that slide, except for the Detroit Red Wings (1-8-1). 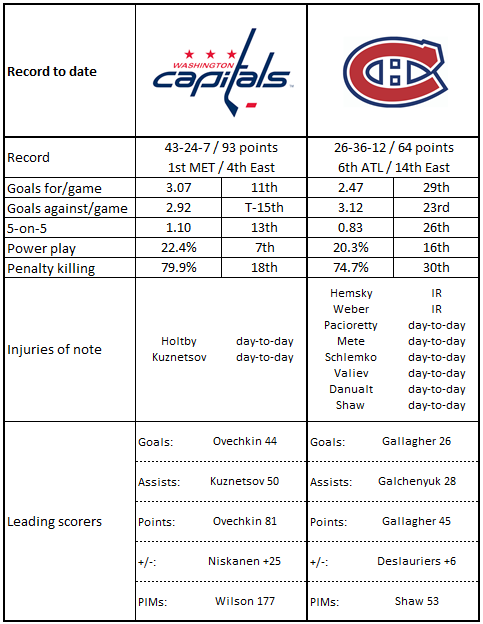 Seems the Habs have had two general problems in that ten-game span. First, they can’t score (18 goals scored). Second, they can’t keep the other guys from scoring (38 goals allowed). With respect to the former, Montreal really misses Max Pacioretty, who suffered a knee injury in what was the last Canadien win before the ten-game slump, a 6-3 win over the New York Islanders on March 2nd. That injury was expected to keep Pacioretty out 4-6 weeks. Since then, the goal scoring has come from few sources and fewer with any consistency. Brendan Gallagher and Artturi Lehkonen lead the club with four goals apiece over that span, going into Friday’s game against Buffalo. Gallagher is one of those annoying players, always stirring things up and getting in opponents’ faces, that 30 other fan bases hate but would love to have on their team. He has already surpassed his career high in goals, the 26 he has at the moment two more than the 24 he recorded in the 2014-2015 season and a far cry better than the ten he had in 64 games last season, a season cut down by 18 games when he broke a finger blocking a shot of teammate Shea Weber. But his contributions almost highlight how thin Montreal's scoring is this season. Gallagher has scored goals in 24 games this season (he has two two-goal games), but Montreal is just 11-11-2 in those games. That the Habs are 19-15-3 in games in which Gallagher has a point this season speaks to the virtues of spreading things around. He is 4-2-6, minus-3, in the ten-game skid, and he is 2-1-3, minus-6, in 13 career games against the Capitals. Lehkonen is a less-known commodity to Caps fans. A second-round pick of the Canadiens in the 2013 entry draft, he is in his sophomore season with Montreal. He had a respectable rookie campaign last season, going 18-10-28, minus-1, in 73 games. Those 18 goals tied for ninth place in last year’s rookie class (with Tampa Bay’s Brayden Point), and his 27 career goals rank 17th in his 2013 draft class (by way of comparison, the Caps’ Andre Burakovsky ranks sixth in that class with 47 goals). His production is off quite a bit this season, having recorded only half as many goals (nine) as last season. That is a product of a drop in shooting efficiency. His shots on goal, last year to this, are roughly equivalent (158 last season, 149 so far this season), but his shooting percentage has dropped from 11.4 percent to 6.0 percent. It is the thing that has come back in his last ten games, though, his four goals scored on just 27 shots (14.8 percent). Lehkonen is 1-1-2, minus-2, in five career games against Washington. Karl Alzner was never a prolific contributor on offense when he was manning the blue line for nine years as a Washington Capital. But even by his standards he is in a slump. He does not have a point in the 1-7-2 slump in which his team finds itself. In fact, he is without a point in his last 15 contests (before Friday’s game against Buffalo), two – both assists – in his last 26 games. He has one goal this season, that on January 7th in a 5-2 win over the Vancouver Canucks, leaving him without one in his last 32 games. Still, he averaging 20:07 of ice time a game (fourth among defensemen on the club). The ice time is interesting in that in games in which he skated more than 22 minutes this season, Montreal is 7-3-3, hardly a surprising outcome for a defensive defenseman who might be on ice more in the later stages of games to protect a lead. The flip side of that is the Canadiens being 6-17-2 in the 25 games he skated less than 19 minutes. Alzner is without a point and is minus-1 in the two games he faced his old team this season. 1. Think the Canadiens don’t miss Shea Weber on the back line? His season ended on December 16th. He suffered a tendon injury in his foot requiring surgery and will not return until next season. In this 1-7-2 slide, no Canadien defenseman has scored a goal. That’s no goals on 85 shots as a group. They have ten assists among eight defensemen to dress in that span. 2. Small wonder that Montreal is 1-7-2 over their last ten games. Only the Dallas Stars have been shorthanded more frequently (36 times to 35 for the Canadiens), and Montreal has the worst penalty kill in that span (21-for-35/60.0 percent). The 14 power play goals allowed over that span is more than the Caps (not the best penalty killing team themselves) have allowed over their last 23 games (13). 3. It probably says something that Montreal has 20 more hits (309) than any other team over this ten-game span. They’re frustrated, they spend too much time without the puck, they get generous scoring. They spread it around, too. There are 12 skaters with at least ten hits over that span. This is not a happy group that plays well with others. 4. You get the feeling they just might wish the season was over. In this ten-game stretch, only the Calgary Flames are shooting to a lower percentage of success (5.4 to 6.2 for Montreal), and the Habs’ 45.8 percent winning percentage on draws is fourth-worst in that span. 1. The Caps have a shot attempt differential on the road at 5-on-5 of minus-225, the worst in the league (New York Islanders are minus-210). 2. Washington has won three of their last four road games after a four-game road losing streak. The run pulled them up in the road points rankings, now one of 14 teams averaging more than one standings point per game on the road. 3. The Caps will try to take advantage of that weak Montreal penalty kill to improve relatively weak road power play numbers. The Caps are just 1-for-13 (7.7 percent) over their last six road games and 3-for-26 (11.5 percent) over their last 12 games away from Washington. 4. Alex Ovechkin has 21 goals on the road this season, more than the next two Caps combined (T.J. Oshie and Nicklas Backstrom with ten apiece). 5. The Caps are one of four teams with more than 400 penalty minutes on the road this season. Their 424 PIMs is exceeded only by Florida (453), Nashville (458), and Calgary (475). The last three seasons have not been kind to goaltender Carey Price. Two seasons ago, he appeared in only 12 games, missing the Canadiens’ last 59 games of the season with a knee injury. After appearing in 62 games last season and posting respectable numbers (2.23 goals against average, .923 save percentage), he has appeared in 44 games this season and posted the worst numbers of his career – a 3.03 goals against average (previous worst: 2.83 in 2008-2009) and a .903 save percentage (previous worst: .905 in 2008-2009). And most recently, he missed 13 games with a concussion, returning just last Wednesday against the Pittsburgh Penguins, allowing five goals on 39 shots in a 5-3 loss. His absence for 13 games was merely a hiccup in what has been a thoroughly forgettable 2018 portion of the season. He did win two of his first three games of the new year, but since then is a ghastly (for him) 2-9-4, 3.28, .887 in 15 appearances. And, high shot volumes have not agreed with him, at least in terms of outcomes. When facing 30 or more shots this season, Price has a 2.70 goals against average and a .922 save percentage, both respectable numbers in that high-volume environment. But his win-loss record in those games is 8-13-4. He has not been able to steal many games backstopping a struggling offense. In 22 career appearances against the Caps, Price is 6-12-4, 3.17, .895, with one shutout. That Brett Connolly scored the only goal against the Red Wings in the Caps’ 1-0 win in Detroit on Thursday should not be surprising (although if he missed the net on a 2-on-0 break with Jakub Vrana on his wing, he could have just kept skating all the way to Zug Island). Connolly has eight goals on the road in just 31 road games, the fourth highest total on the team (trailing Nicklas Backstrom and T.J. Oshie with ten apiece, and Alex Ovechkin with 21). His shooting percentage on the road is of the “c’mon, you’re putting me on” category (8-for-27/29.6 percent, the best road shooting percentage of any player in the league with at least 20 shots on goal). If anything, he’s been even pickier this year over last overall in terms of shots, but with similar results. Last year he played in 66 games, and this year he has appeared in 63 games so far. Both years – 15 goals. But whereas he recorded 15 goals last year on 81 shots (18.5 percent shooting, then a career best), so far this season he has 15 goals on just 64 shots (23.4 percent, a new career best). If the Caps really do have a “quality over quantity” philosophy about shooting, Connolly is the poster boy. He is 2-1-3, minus-1, in 15 career games against Montreal. The Caps have made Bell Centre their own in recent years. Washington has earned standings points in 14 straight games in Montreal, dating back to November 2009, posting a record of 12-0-2, and they have won their last four visits to Montreal. One would have to think that if Montreal is going to scare up any inspiration to maximize their effort, it would be to end that streak. But this is a team that has found it hard to win on home ice against anyone lately. The Canadiens are just 3-2-3 in their last eight games at home and have been shut out twice. This is precisely the sort of team that the Caps need to grind on early to take the fight out of them and the crowd out of the game.